BBC reporter Jacqui Oatley said she had "never seen anything like it in the women's game"
Paris St-Germain say there was "no evidence of wrongdoing" by fans denied entry into Thursday's Champions League match at Chelsea when weapons were found on a supporters' coach. Knuckledusters, fireworks and drugs were discovered and up to 50 fans were turned away from Kingsmeadow before the quarter-final first leg. Met Police confirmed a man was arrested for possession of Class A drugs. "We express our fullest support to fans of Paris Saint-Germain," PSG said. "The local authorities have not provided any evidence of wrongdoing, at the least no facts that would justify such a ban to attend the match. "All of our supporters have been searched, and if any of these searches or facts had been under criminal law, we can imagine that the concerned supporters would not have been able to leave British territory without being worried." 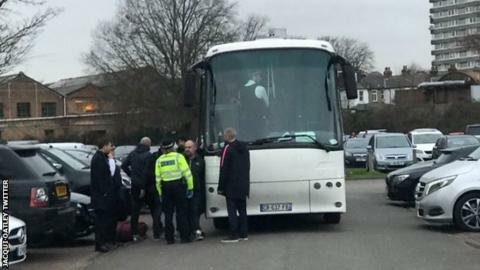 Police were first called to reports of vandalism at the stadium at 08:00 GMT, almost 11 hours before the 19:05 kick-off, then later to disorder at Waterloo and Wimbledon stations. Reports suggested a door at the stadium had been broken and parts of the ground had been daubed with pro-PSG graffiti, which is understood to have been removed. A small number of PSG supporters were permitted entry to the ground. "Surprisingly, we note that Chelsea, on the morning of the match, did not want the presence of our supporters, arguing that the alleged damage to the stadium which are, according to local testimonies, prior to the arrival of our fans in London," PSG said in their statement. The French club added it supported fans who had "arranged their schedule to come support our women's team in the middle of the week". It understood the fans have all returned to France, while PSG regard the incidents as anti-social rather than violent or likened to hooliganism. Uefa will not be charging PSG for the incident. Blues boss Emma Hayes said supporters "should not be discouraged" from travelling to France for the second leg in Paris on 27 March, after their 2-0 win. Hayes says she expects a "hostile" atmosphere at Stade Jean Bouin in the French capital, but added: "We have to remember that the women's game is progressing, that fans are following, and with that comes the same level of scrutiny. "Ultimately they have to behave, whether it's our fans or their fans. The police dealt with it in the right way. "I'm sure our security will be well briefed. The police took care of what they had to, and I expect the organisation and preparation for that will make sure that our fans are safe. "I don't think we should discourage anyone from going." Violence has previously marred men's fixtures between the two clubs. Four Chelsea supporters were given suspended one-year sentences by a French court after video footage emerged in 2015 of fans pushing a black man off a Paris Metro train before a Champions League match. In 2014, European football's governing body Uefa ordered a partial closure of PSG's Parc des Princes stadium for a Champions League game after disabled Chelsea supporters claimed they were spat at and had coins and bottles thrown at them during a quarter-final match at the ground in the competition. Chelsea Women are aiming to become the first English club to get to the Women's Champions League final since Arsenal in 2007, while PSG were finalists in 2015 and 2017.